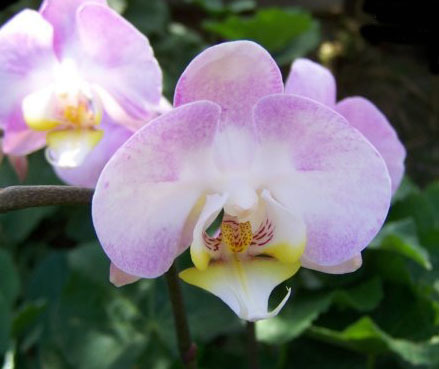 The Charlottesville Orchid Society is an educational, non-profit organization dedicated to the exchange of knowledge about orchids and their culture. The society is affiliated with the American Orchid Society. We have donated orchid books to the city library and maintain a Society library of books and videos for use by our members. Membership is open to anyone. Members meet on the second Sunday of the month, September through June at 2 p.m. Meetings are held at locations stated in the monthly newsletter or in members’ homes. It is very instructive to see how others grow their plants and these occasional forays to members’ homes provide an intimate setting for discussing your new plants or that first blooming of a seedling. We adjourn for the summer, meeting again in September. Directions to the meetings are provided in the newsletter. Meetings include a program often featuring orchid authorities from around the world, a show table highlighting members’ plants, and a sales table of plants brought by the various speakers or by members.